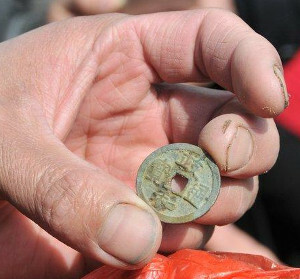 A large quantity of coins dating to the Tang and Song dynasties was recently unearthed by a large excavator removing silt from a river in Yancheng (盐城市), Jiangsu Province, according to media reports. At approximately 10:00 AM on March 21, the excavator was dredging a small 6-meter wide river that runs through Longgang Town (龙冈镇) in Yancheng when it uncovered a pile of ancient Chinese cash coins that had been stored in a earthenware pot. 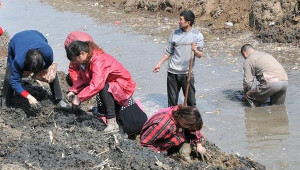 Word of the discovery quickly spread and, as can be seen in the image at the left, many of the local villagers hurried to the site to search for “treasure” buried in the mud. It is estimated that the villagers recovered 200 – 300 catties (斤) equivalent to about 267 – 400 lbs (121 – 181 kgs) of coins before the authorities arrived on the scene to restore order and protect the “cultural relics” which, according to Chinese law, belong to the state. Mr. Zhao Yongzheng (赵永正) of the Archaeology Department of the Yancheng Museum (盐城市博物馆考古部) rushed to the scene and provided information on the discovery. A preliminary investigation, according to Mr. Zhao, identifies the coins as dating to the Tang and Song Dynasties. 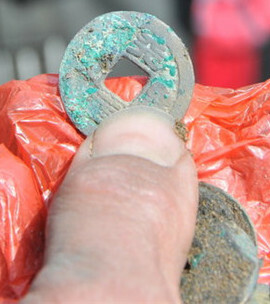 Media reports mention that among the coins dug up were kai yuan tong bao (开元通宝) from the Tang dynasty as well as tai ping tong bao (太平通宝), zheng he tong bao (正和通宝), and xiang fu yuan bao (祥符元宝) from the Northern Song dynasty. The image at the left shows one of the coins found by a villager. The image is clear enough that the coin can be identified as a tai ping tong bao (太平通宝) which was cast during the years 976 – 989 of the reign of Emperor Taizong of the Northern Song Dynasty. Another coin dug up by a villager can be seen in this image. The coin is a tian sheng yuan bao (天圣元宝) written in seal script. Coins with this inscription were cast during the years 1023 – 1031 of the reign of Emperor Renzong of the Northern Song Dynasty. The newspaper articles contained the image of one additional Song Dynasty coin. At the left is a zheng he tong bao (正和通宝) coin written in Li script. This coin was cast during the years 1111 – 1117 of the reign of Emperor Huizong of the Northern Song. Mr. Zhao stated that because the coins were mainly from the Tang and Northern Song dynasties, this coin cache was probably buried at the beginning of the Southern Song dynasty (1127 – 1279). Several of the village elders were able to provide information in regard to the possible source of the coins. In the distant past, a temple was situated on the site. The temple was later destroyed but the coins may be linked to the ancient temple. 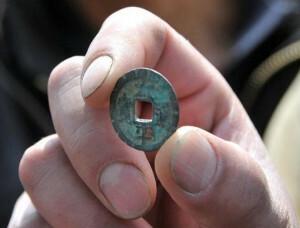 The village elders also recalled that old coins were discovered in about the same area in 2007.